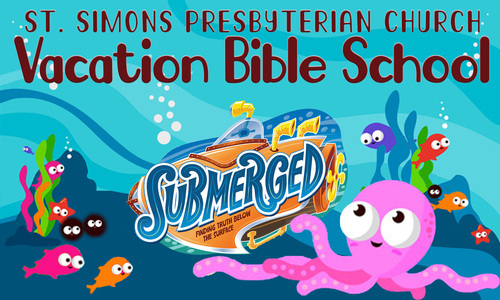 Dive in for an exciting adventure under the sea at St. Simons Presbyterian Church Vacation Bible School! Thrilling discoveries await just beyond the portholes of our VBS Submarine. As kids are submerged in God's Word, we will discover that Jesus sees us for who we are on the inside... down deep! Participants and volunteers may sign up here. Participants should be ages Preschool to 5th grade (birthday BEFORE Sep 1, 2015). Volunteers may be middle school (entering 7th grade) to adult. A nursery is available for volunteers. We suggest a $15 donation to cover costs of lunch and T-shirt; however, the donation is not required.